A Babylonian amora of the third generation (fourth century); contemporary of Ḥisda, NaḦman, and Abba bar Memel (B. B. 70a, Ket. 91a, Yer. B. M. i. 7d). 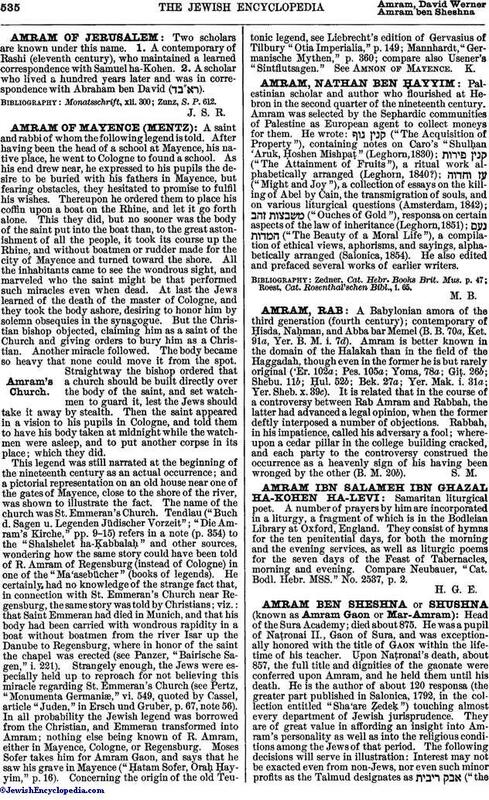 Amram is better known in the domain of the Halakah than in the field of the Haggadah, though even in the former he is but rarely original ('Er. 102a; Pes. 105a; Yoma, 78a; Giṭ. 26b; Shebu. 11b; Ḥul. 52b; Bek. 27a; Yer. Mak. i. 31a; Yer. Sheb. x. 39c). It is related that in the course of a controversy between Rab Amram and Rabbah, the latter had advanced a legal opinion, when the former deftly interposed a number of objections. Rabbah, in his impatience, called his adversary a fool; whereupon a cedar pillar in the college building cracked, and each party to the controversy construed the occurrence as a heavenly sign of his having been wronged by the other (B. M. 20b).